Daniel Brown has extensive experience defending allegations of dangerous driving. Recognized as one of Toronto’s top dangerous driving lawyers and a specialist in criminal law, Daniel is often called upon by the media to comment on dangerous driving cases in the news. Recently, Daniel spoke to CTV News about a woman convicted of dangerous driving causing death and The Lawyers Weekly about why a dangerous driving conviction was overturned on appeal. The remainder of this article defines the criminal charge of dangerous driving, reviews possible defences, and summarizes the penalties associated with a dangerous driving conviction in Toronto, Ontario. If you are charged with dangerous driving you should contact Daniel Brown at (416) 297-7200 for immediate legal advice. Section 249 of the Criminal Code of Canada reads that one commits the offence of dangerous driving by operating a motor vehicle in a manner that is dangerous to the public, having regard to all the circumstances, including the nature, condition and use of the place at which the motor vehicle is being operated and the amount of traffic that at the time is or might reasonably be expected to be at that place. How is dangerous driving determined? Determining whether one has committed the offence of dangerous driving is done by looking at the manner in which a motor vehicle was operated as opposed to the consequences of the driving. A court cannot conclude from the consequences alone, including a death or a collision, that the vehicle must have been operated in a dangerous manner. The nature of the driving must be established independently from the consequences. What standard is used to assess whether the vehicle was driven dangerously? Dangerous driving is assessed by examining whether the accused’s conduct, viewed objectively (using the standard of the “reasonable person”), amounted to a marked departure from the standard of care that a reasonable person would observe in the accused’s circumstances. The prosecutor need not prove that the driver intended to drive dangerously. Rather, the court assesses the dangerous conduct against the standard expected of a reasonably prudent driver, regardless of the driver’s intention. If the prosecutor can prove that the driving was a marked departure from how the reasonably prudent driver would have driven in the circumstances, the fault element of the offence will have been established. How is the term “marked departure” defined? The accused’s conduct must amount to a marked departure from the standard of care that a reasonable person would observe in the accused’s circumstances. A mere departure from the appropriate standard of care will not constitute a criminal offence for dangerous driving. The distinction between a marked departure and a mere departure from the norm is a matter of degree. Some departures from the requisite standard of care, while dangerous, may not be “marked” or “significant”. The lack of care in driving must be serious enough to merit punishment. It is only when there is a marked departure from the norm that objectively dangerous conduct demonstrates sufficient blameworthiness to warrant a criminal offence. What if the dangerous driving was caused by a momentary loss of attention? Although there may be exceptions, momentary inadvertence that occurs within a few seconds, while in the course of driving that is otherwise proper, is more suggestive of civil liability rather than the “marked departure” required for a criminal conviction. Therefore, most cases demonstrating only a momentary loss of attention will not be sufficient to ground a conviction for dangerous driving. How is the term “dangerous” defined by the court? Must the public actually be put in danger to ground a conviction for dangerous driving? The prosecutor is not required to prove that a person was actually endangered by the accused’s driving and a conviction may be entered if the accused’s driving was dangerous to the public which might reasonably be expected to be present at the time of the impugned driving. 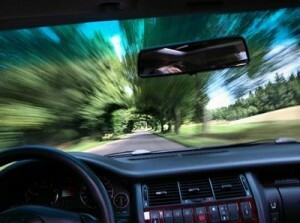 Can speeding alone amount to dangerous driving? Excessive speed, depending on the context in which it occurs, can endanger the lives or safety of the public and amount to a marked departure from the standard of care of a prudent driver so as to support a conviction for dangerous driving. The determination of liability based on evidence of excessive speed also has to take into consideration the speed at which other vehicles on the highway are driving, as well as the speed at which vehicles may be safely driven on the highway. Consideration has to be given to the actual speed; the accused’s ability to maintain control over his or her vehicle, and the accused’s ability to reduce his or her speed to react to an unexpected occurrence or to avoid an accident. Consideration also has to be given to, the nature of the roadway and place where the driving occurred, the distance over which the accused maintained the high speed, whether the accused was keeping a look-out compatible with operation of the vehicle at a high speed, and the entire driving pattern. Can impairment by drugs or alcohol amount to a defence to dangerous driving? It is not a defence to claim that the dangerous driving at the time of the offence was not voluntary or intentional by virtue of a person’s intentional drug or alcohol consumption. A person’s voluntary consumption of drugs and/or alcohol under circumstances in which he knew or ought to have known that his ability to drive might thereby be impaired is sufficient to support a conviction for dangerous driving. Can the involuntary consumption of drugs/alcohol amount to a defence to dangerous driving? Involuntary or unintentional consumption of drugs and/or alcohol, which lead a person to drive in a dangerous manner, may operate to negate the fault element for dangerous driving. For example, if a person operates a vehicle in a dangerous manner after becoming unknowingly drugged at a bar, they may be acquitted of the dangerous driving if they were unaware of the potential side effects the drugs had on their ability to drive. Unexpected medical impairments such as seizures, hallucinations or black-outs may also provide a person charged with dangerous driving with a defence. However, if the medical impairment was caused as a result of the driver’s voluntary decision not to take medication for the pre-existing condition, his actions will not be excused by his medical conditions. The accused’s guilt would be grounded on the historical awareness that, because of a diagnosed condition, the accused could be a danger to the public while driving. A person found guilty of dangerous driving may serve a maximum penalty of up to five years in jail. The penalty is increased to a maximum penalty of either 10 or 14 years depending on whether the person is found guilty of dangerous driving causing bodily harm or dangerous driving causing death. Along with the potential of a significant period of incarceration, a person found guilty of dangerous driving will also lose their drivers license for a period of at least one year in Ontario. A Judge may also impose a Canada wide driving ban for anyone found guilty of dangerous driving. It is always possible to appeal a convction or sentence for any charge including dangerous driving. To read more about the criminal appeal process read: Appealing a criminal conviction or sentence. In some instances it is also possible to suspend the driving prohibition in order to get back a drivers license pending the outcome of one’s appeal. Every case of dangerous driving is fact specific and needs to be assessed on an individual basis. Personal circumstances and the other circumstances surrounding the driving are important considerations. Please call Daniel Brown at (416) 297-7200 to arrange a consultation to discuss a dangerous driving charge or other criminal matter. I was arested for dangerous drivind haven’t gone to court yet, can i still go to Canada ?